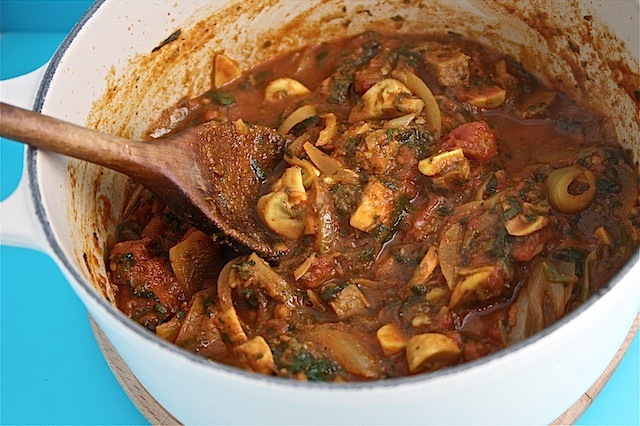 Meat from the weekend roast was brought back to life in this quick leftover lamb curry with mushrooms. One of my new year’s resolutions has been to buy a generously sized joint of meat for Sunday lunch and to use the left overs during the week. So far we’ve done chicken, lamb and pork and next week I will buy beef. It was actually my first time roasting a full leg of lamb. The joint cost £17 in Waitrose and was enough for 5 meals for 3 people which I think was excellent value. I think my husband even had cold sliced lamb on his sandwiches for work one day although I don’t think this is the best way to enjoy left over lamb. There was the original roast dinner, two curries, a stew with pearl barley (one portion of which was blended as soup for my lunch the day after) and even enough to pop into some Cornish pasties. I calculate this joint fed us at under £1 per portion and I have lots of other ideas for the next leg we buy. I’ve not even started on Middle Eastern lamb dishes with cous cous! Since this dish uses leftovers I am sending it to Credit Crunch Munch the new thrifty food event organised by Helen and Camilla. 1. Heat the oil in a medium size pan and fry the sliced onion, garlic and cumin seeds. After a couple of minutes add the ginger, chilli, cumin powder and tumeric. 2. When all the onion is coated with the spices add the can of peeled plum tomatoes – bash them with the wooden spoon to break up if they’re not ready chopped. 3. Add the mushrooms and leftover lamb and stir. Allow the curry to simmer for five minutes. 4. Meanwhile defrost the frozen spinach in the microwave. Or if using fresh, pop the leaves on top of the curry and put the lid on so the leaves can steam inside. 5. Stir the spinach into the curry. Add the garam masala and ground coriander before serving with rice or flat breads.